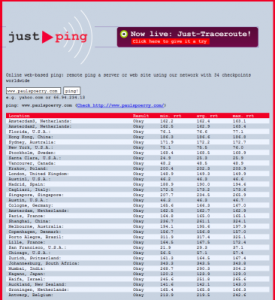 just-ping.com is a really useful site for pinging Internet hosts. The service tries to ping a given systems from 34 points all over the world, and gives you a nice web view of the results. It’s pretty interesting to see the ping times from around the world. For instance, Johannesburg, South Africa returns an average ping result of 343.5, whereas Chicago, USA returns an average ping result of 57.1. That of course makes sense given that I use a US based host, but still interesting. The same people who provide just-ping.com also provide just-traceroute.com which provides tracert functionality from 4 locations worldwide. It’s not quite as fancy as the visual traceroute tools on the net but it does provide traceroute visibility from 4 distinct places around the world.